Y’all. These cookies! I mean, if you love golden milk lattes like I do, then you should probably try these cookies. And, by probably, I mean definitely. They’re so moist and soft and full of that delicious golden milk flavor! If you’re not familiar with golden milk lattes (or GMLs as I call them), then start right here and make yourself one. 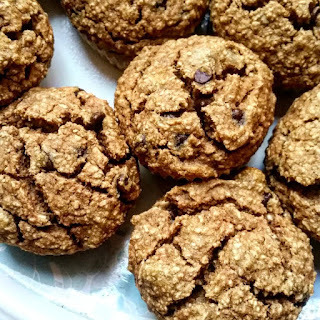 Then bake up some cookies to indulge in your new (healthy) obsession. Mmm! When a friend comes up with a new baked oatmeal flavor, you try to make it. 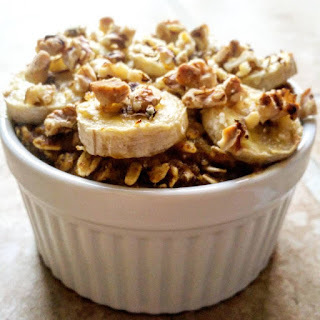 And sometimes you crush it in one try, like with this baked pina colada oatmeal. Mmmm, you guys!! This one is totally a hit. I absolutely love pineapple (see last week’s pineapple orange juice for further proof) and can’t wait to make more of this bad boy this summer. It’s like a delicious treat for breakfast, so you can’t go wrong. These donuts, you guys!! I love me some donuts, but I love when I can make them AND they’re delicious AND they’re sneakily healthy for me! These have fruit and oats, so they’re practically oatmeal. Which makes them the perfect breakfast! You can make these in advance, or you can eat them fresh and warm right out of the oven. Either way, you can’t go wrong. They stay soft and moist in an airtight container, but when the chocolate chips are still melty from the oven? STAHP. IT. Soooo good! This one got a huge “YES!” from Husband. I *really* wanted jelly-filled peanut butter muffins but thought I’d make a jelly-filled peanut butter oatmeal instead. When I asked Husband if he had a flavor preference for a baked oatmeal, he looked at me with stars in his eyes and said, “We have apples!” So peanut butter apple it was. And dude. SO glad we did it. Mmmmmm!! Remember when we made sweet potato carrot cake muffins? No? Well, go check those out and then come right back, y’all, because we’re making some baked oatmeal with the same delicious flavor and just as much, if not more, nutrition! YUM! I used purple carrot shreds for this, but you can use orange (or whatever color carrot your heart desires). The taste will still rock your world. It’s pretty common knowledge that chocolate is bad for dogs. But it’s not super common knowledge that carob is just fine for them! So let’s make our pups some chocolaty treats that are safe and healthy for them, shall we? This is a game-changer for me. I used to LOVE English muffins, but avoiding the processed stuff available at the store is important to me. Doesn’t mean I won’t splurge on some Dave’s Killer bagels every now and then (not GF – sorry! ), but when a girl wants an English muffin, she needs something simpler. Like THIS recipe I customized from The Big Man’s World. It’s actually from Natalie at Feasting on Fruit, and I love her blog so much and try a lot of her recipes. And this one is a real winner, you guys. Breakfast just got a little better. Have any pineapple left from the sweet pineapple oatmeal we made on Monday? I sure hope so. Because we’re about to make some seriously amazing baked pineapple upside-down cake oatmeal. That’s right. We’re doing this. Come on. Get into the kitchen with me and make this deliciousness happen. Fresh pineapple is so, so good. Isn’t it? When it’s ripe and not burning your mouth off, it’s wonderful. And, recently, we’ve found out that it’s mega delicious in oatmeal! (What isn’t delicious in oatmeal, really?!) Usually, I’m the Oatmeal Queen around here (with baked oatmeal being my fave thing ever). But Husband has been making this stovetop pineapple oatmeal lately, and I’m so thankful because it’s amazing and simple.